Monchhichi (pronounced Mon-Chee-Chee) fashion pets have lived in peace and gentleness for a long, long, while, tucked away in a small corner of a land called Reverie. Since stepping into the "Outside World" only a few years ago, the Original MONCHHICHI fashion pets have traveled to Japan, Germany and France, bringing happiness to thousands of people along the way. 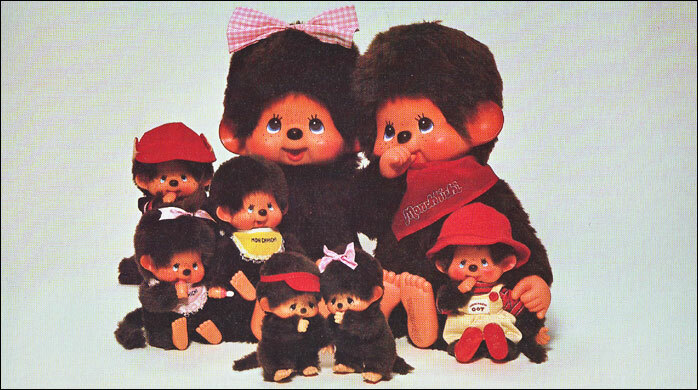 Monchhichi is Happiness ! We are Monchhichi fashion pets. Have a safe and happy playtime ! Ces peluches sont distribuées en France sous la marque Ajena. Ajena est une marque du groupe Nounours fondé en 1962, l'une des dernières sociétés à produire des peluches en France.